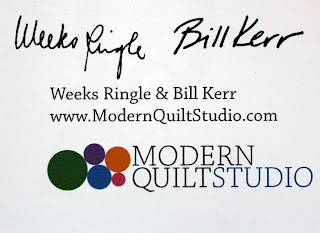 A few weeks ago I volunteered to review Modern Quilts Illustrated, the new publication by Weeks Ringle and Bill Kerr of Modern Quilt Studio, and share it with you. I saw a copy of it about a month or so before, at the Modern Meet Up at the Cincinnati International Quilt Festival. And I think it's great. 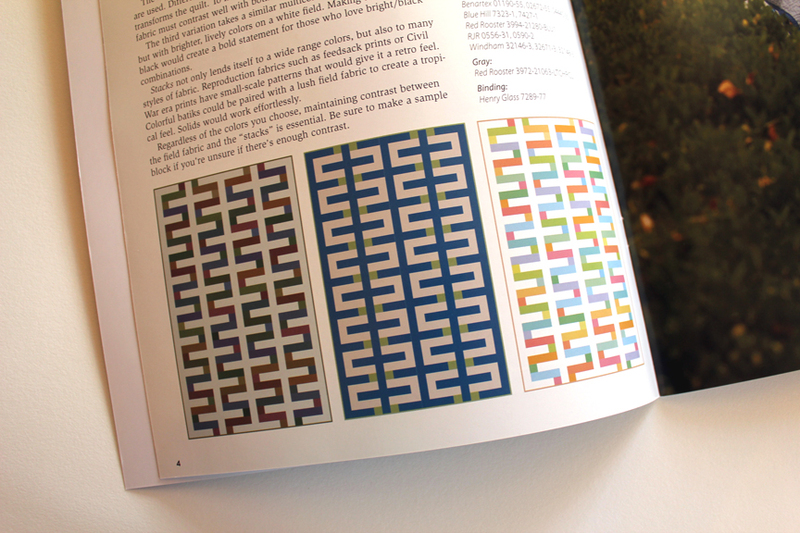 In the first issue, there are three patterns, two of which are for full sized quilts and one for a wall hanging. 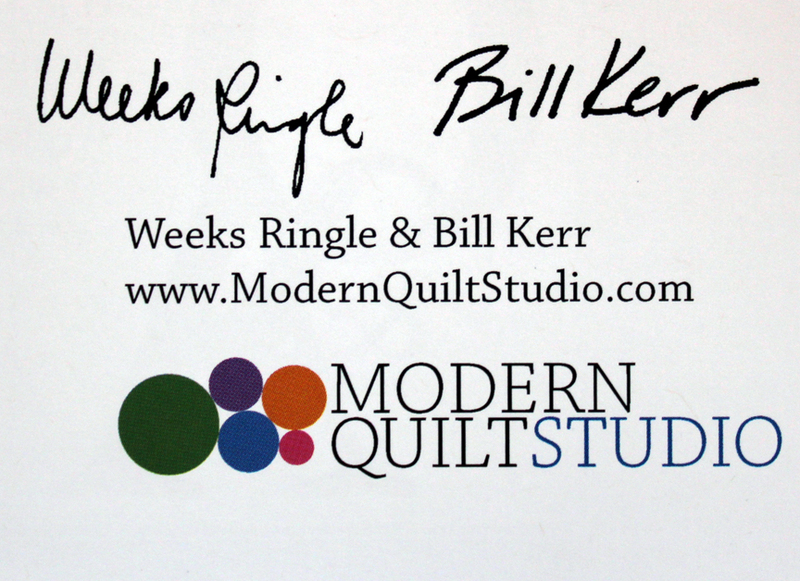 I love that Bill and Weeks show how each pattern would look in different color ways. I think people sometimes have difficulty envisioning what a pattern will look like in other colors and this will help immensely. 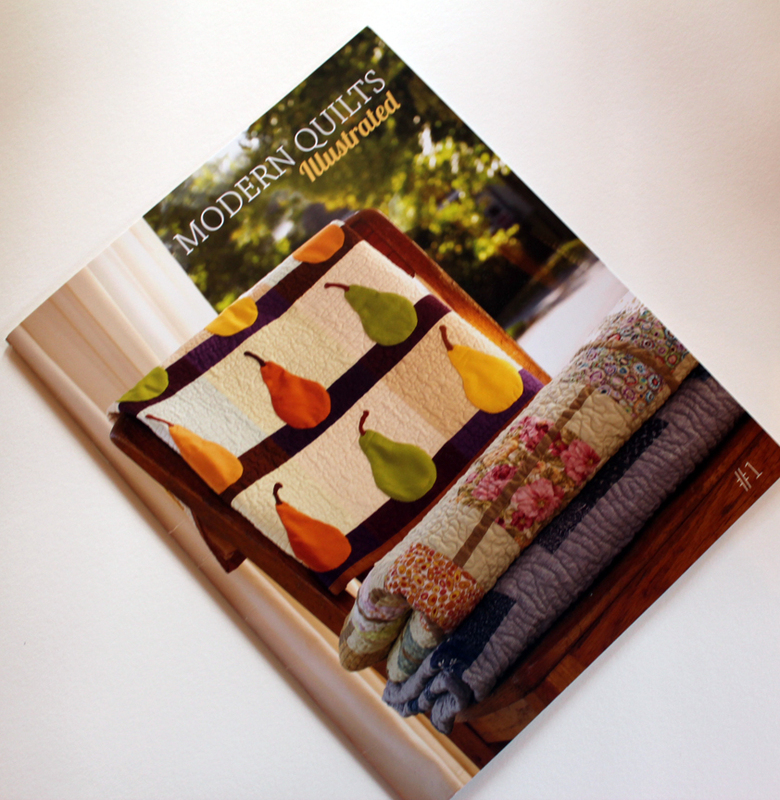 The instructions are clearly written and easy to follow, and the format of Modern Quilts Illustrated is just lovely. Just as the name states, there are lots of clear illustrations for all the projects, and lots of step-by-step illustrations, too. 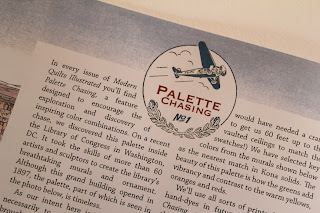 There are also sections full of tips on quilt making basics, as well as an entire section devoted to encouraging readers to explore and discover inspiring color combinations, called "Palette Chasing." As someone who loves to play with color, I think this is so great! 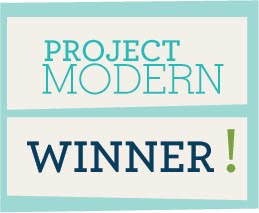 I think Modern Quilts Illustrated would be a great addition to any library. To purchase a copy for yourself, please visit Bill and Weeks' site to order. And I'd love to share a copy with you, so let's have a giveaway! To enter, leave a comment on this post and tell me a little about your creative plans for the summer. Please be sure that your email address is either in the comment or connected to your blogger profile so I can contact you if you are the winner. I'll use the random number generator to choose one winner and the giveaway will be open until Tuesday June 13 at midnight ET. International entries are welcome! Good luck!! I have their last book, they put together beautiful work. Creative work for the Summer is ongoing. I'm working on crocheted baskets, lots of zip pouches and I AM going to sew my first skirt/dress/or shirt! Oh yeah, quilty swaps and planning a new quilt for my son. I am a big fan of these authors and have their last book. Thanks for the opportunity to win this publication. As for summer creative plans....I am working on a challenge piece with the theme Time Flies for our triannual exhibit of our Guild called Quilts on the Rocks in Sudbury, Ontario Canada. Thanks again. This summer I plan to finish two quilt tops that are sitting waiting for something to happen to them! Our quild - the London Modern Quilt Guild currently has a show of mini quilts up in JOhn Lewis on Oxford Street in London :) Yay!! Great book - great giveaway!! I would love to see this book so I hope I win. My summer project is a quilt for my one year old granddaughter. I am making several different house blocks (including an apartment building) with Kaffe Fassett fabrics. I plan on taking a vacation day every Friday and just quilt. Thanks for the giveaway. I plan to get a bunch of Christmas gifts made and I HOPE to make a couple tablerunners and a wallhanging to use in my house. The things for me always get put off until last. My plans for this summer are to finish up a number of STITCHED workshops in mixed media, plus actually quilt a couple of WIPs. Of course - plans are made to be changed, right? My plans for this summer include serious progress on *several* quilts. I have entered quilting slowly (i.e. one quilt at a time, sewn slowly over a long period of time! ), and suddently I have three quilting projects in front of me right now that I want to get done by the end of summer! Must get busy! I am making little baby dresses and outfits for my new granddaughter due in October. Thanks forth give away. You are so generous. I am finishing the quilting on a wedding gift for my niece, then I need to do a charity quilt and finally a big picnic quilt for my family. I am sure there will be many random projects sprinkled in, too! Thanks for the giveaway. I do like the one pattern you showed. I just saw a guild member's quilt with a similar design and it was totally different than any of the suggestions shown but also VERY beautiful. I have one wall hanging that is in progress and I was waiting for quilting inspiration and I have received it, so I'm onto quilting and binding it. As I'm off on holiday soon I want to make a 241 tote to take with me!! I would like to finally make a quilt for myself, maybe this summer! I have three quilts to work on which are in various stages of completion. I keep getting distracted by gardening and enjoying time outside while I can. Summer is too short! Thanks for the great giveaway. Need to finish quilting 2 large quilts. Then on to more piecing! I love the more modern look! thank for the chance to win this book--more inspiration! Summer plans...well; lol. I have ahead of me...5 commissioned quilt tops to hand quilt...I am taking part in the Road Trip QAL on here; see my sidebar,please...looks like a busy one. For this summer my plans are to start on a Christmas quilt. Something fun and cheery for the kids to enjoy! This summer, I am working on a queen-sized quilt for our bed. I'll have to make it in quarters & then join them in a QAYG method. Thanks for the chance to win. i am actually finally finishing my first quilt. just 1/3 of the fmq left. then i think i will finish a jacket for myself before starting my next quilt. I'm on a kick to use my stash. So this summer will be all about that. And making big kid bed quilts for my son and niece. This summer I hope to get a few UFO's quilted and can move on to new projects. Thanks for a chance! i think if i hope to finish anything, i need to lower my expectations, and take any large quilts off the table...maybe small hand sewing projects ... i would like to try a new tote or two also. I no specific creative plans this summer. I just took my first quilting class on beginning piecing. So I hope to start my first quilt. This book would be a great help. 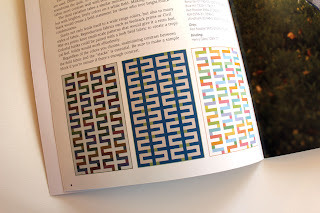 I am going to take a class from Jacquie Gering in a few weeks, I plan to be inspired to quilt the rest of the summer :) This publication looks great, thanks for the chance! Summer plans? I'll be pretty busy sewing quilts! I have 4 baby quilts "in process" and one imagined; a twin bed sized quilt ready for binding, and I just received - TODAY! - the fabric for my next project - a twister quilt! Add to that my desire to do a quilt for my son, graduating from Chiropractic school in December, and a promised queen size quilt for my granddaughter who is getting married in April. Yes, I will be one busy little quilter! Would love to have inspiration from the Modern Quilts Illustrated book - my quilt "Eclectic" is kind of modern on the back (and my favorite) side! I recently took a long arm class so and I have a date set up soon to finish a quilt with the long arm for the first time. I'm hoping it will be the start of something fun and less frustrating. Small work spaces and large quilts are too much for me. HELLO! WORKING ON READING,RESTING AND ENJOYING THIS SUMMER!!! Christmas before last, my daughter gave me one of their books. Fabulous! my family thought I was nuts when I started jumping up and down. i love that book. my summer sewing plams are to work on building skills and burning stash. regrouping if you will. 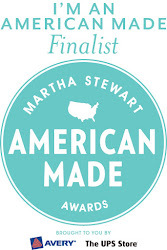 I want to be committed to improving my machine quilting skills. I inventoried my stash and I'm working on finding projects to utilize the older fabrics before they go out of style. Well it's just started winter here but I'm hoping to make a quilt for each of my boys for their birthdays. I plan to sew up a few bags and finish the sashing on one quilt and then finish the appliqué quilt I started. Well it just goes on and on. Need to finish these so I can make some of the new modern quilts. I'd love to finish a quillow, finish my daughter's quilt, and make my son a quilt this summer. I think that may be a bit ambitious for me! My list is pretty short, I'm hoping to accomplish a sundress and a top for ME and a quilt for my youngest baby! I'm planning to finish up some long-lingering quilts, dabble in some mini quilts to satisfy my "new project" crushes, and come up with something special for the talknt swap. I love these two! This summer, I'm working on quilts for beds at our new cottage -- summer ones! My plans for the summer are to quilt as many tops as I can and then I a wedding quilt and a couple of birthday quilts to make. I want to play around with printing fabric and possibly some hand dyeing. It is going to be a busy summer! This publication looks like it would be full of inspiration! I ahve seen their last book and it was hard to put down! Thanks for the thoughtful review! I am planning on making a batik quilt for my son this summer -- love the color play involved with batiks! this book sounds awesome! finish a purse I started to make last week (short term) and make a scrapbook/welcome book since we are going through the adoption process - eeks, so excited! maybe work on another quilt! Summer projects?! I need to sew some summer hats for my boys' growing heads :o) A beach-y quilt and perhaps another skirt for me! The book looks great, thanks for the chance to win! I have to finish a queen bed size quilt that I'm making for my mother. I also have the pattern for Amy Butler's Birdie Sling bag that I want to make. Thanks for the lovely giveaway.